The total area of Thailand is more than 513,000 km² [ 198,110 mi² ] and is divided into four main geographic regions. Accordingly the Thailand National Parks vary depending upon the climatic conditions affecting diversity. In this web site we intend to detail Thailand’s National Parks in East Thailand and North-East Thailand ( known as ISAN. In doing so we will specify the geographical region, vegetation types, major ecosystems and common plant species, and also what animal species can be found the National Parks. General characteristics and classifications of these will be described in separate detail and linked to each National Park web page or pages where relevant. Thailand is home to over 15,000 species of vascular plants and 16,000 species of animals [ 960 bird species, 310 reptile species, 107 amphibian species and 285 mammal species ]. There are in excess of 70,000 species of insects and 1,200 species of butterflies. This biological diversity stems from Thailand’s location. Thailand lies between the Tropic of Cancer and the Equator [ from 5.30 to 20.30 latitude North and from 97.2 to 105.3 longitude east ]. 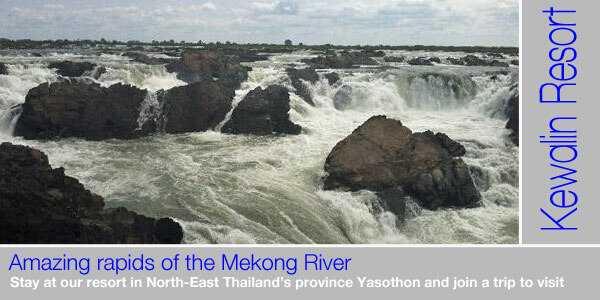 One of the important rivers for Thailand is the Mekong River, for hundreds of kilometres forming the border with Laos. Our B&B lies not so far from the Mekong River, so a ride to the borders of the river is easy with us.